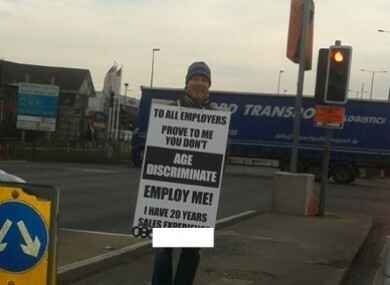 WEXFORD DAD OF five, Brendan Coleman, spent days by the roadside at Newland’s Cross last December, wearing a placard appealing to employers to offer him a job. A month on, he has 10 job interviews with various companies, and even some job offers. To all employers – prove to me that you don’t age discriminate – employ me! I have 20 years sales experience. He took the unusual step after losing his sales job in 2012 and finding it difficult to find a job, despite trying “all the conventional” ways of looking for one. Today, he reported that he is confident the approach will help him find full-time employment. “They have been very positive,” he said of his interviews so far. He did admit that if he was to undertake the campaign again, he would do so in October or November, rather than close to Christmas. Coleman said he was “surprised” that he didn’t get any job interview offers from people in his home county of Wexford, and said the bulk of the offers came from Cork and Dublin. While he has been offered at least one position that is based outside Wexford, that specific job would have involved too much time away from his family, he said. He said his family are “delighted” with his progress so far. “Had I not gone to Newland’s Cross I obviously wouldn’t be doing the last eight or 10 job interviews,” he pointed out, adding he is very appreciative of the efforts made by the companies who contacted him. He has more interviews lined up next week. Coleman hopes that he will have full-time employment secured by the middle of February of this year, and remains hopeful that he will get his ideal job. Email “Roadside sign campaign gets unemployed dad 10 job interviews”. Feedback on “Roadside sign campaign gets unemployed dad 10 job interviews”.